There are things we step away from, and writing here has been one of them. Do you find it harder to return the longer you have been away? I wrote three posts in 2016 and not one last year. November and December are rough months. Teaching and being an artist consume my hours. It has been that way for several years and I found myself missing the days of drawing cards and sending them out at Christmas time. To give to my favorite people at work and to give to people I barely know at work. To say thanks to friends and strangers who buy my art. A couple weekends ago I thought of two cousins I have not seen in years. Then I heard one had died that weekend. 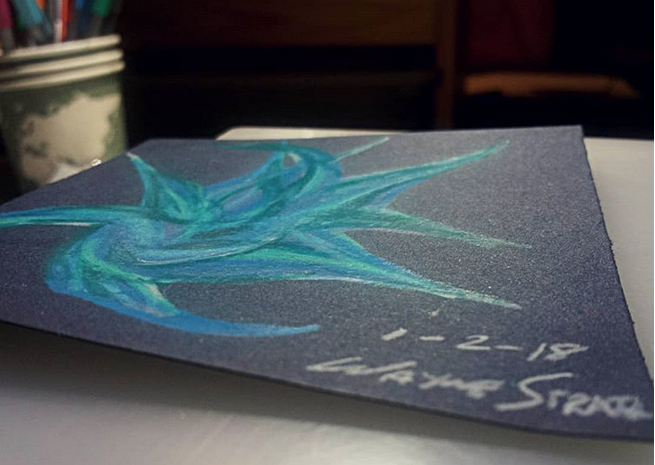 Today I sat down and drew card 4/365. It is for my uncle and aunt who are mourning the death of their child. A child who is older than I am. I drew the card with intention. And maybe the card will say what is so hard to place into words. "I am so sorry..."
I hear that stating one's goals can lead to failure. But I also know that stating my mistakes leads to improvement. My art of choice for many many pre-glass years was drawing cards. Stepping away, was a mistake. At work I often walk about the campus in my free time. I visit people. Say hello. Check in on how they are doing. There are many rooms that have one of my cards hanging on the wall. It shocks me, but it should inspire me. To draw cards. * OK, so I cheated and got a head start. While on my Holiday Vacation, I drew 20 cards between 12/24 and 12/31 so I have a back up of sorts. I can draw 345 cards and still meet my goal. And really is this a failure if I only draw 221 cards? I don't think so.